Jane Sanders, wife of Sen. Bernie Sanders (I., Vt.), is accusing Brady Toensing, the man responsible for the FBI probe into bank-fraud allegations against her, of triggering the investigation out of sexism. 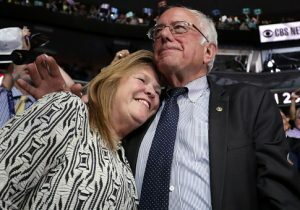 "I find it incredibly sexist that basically he's going after my husband by destroying my reputation, and that's not OK," Jane Sanders told the Boston Globe. The FBI is investigating allegations that Jane Sanders fraudulently obtained a loan for the now defunct Burlington College. She was president of the school from 2004 to 2011. The college closed down in 2016 after it was unable to pay off its debt and lost its accreditation. The FBI probe began in early 2016 after it received a complaint about possible bank fraud. The complaint was filed by Toensing, a former official for Donald Trump's presidential campaign. Toensing has been investigating Jane Sanders' tenure at Burlington College since 2014. Toensing's complaint claims that she had purposely misled a bank in order to secure a loan to purchase new land for the college. "Ms. Sanders's privileged status as the wife of a powerful United States senator seems to have inoculated her from the robust underwriting that would have uncovered the apparent fraudulent donation claims she made," his complaint said. Toensing began his own investigation into her activities at Burlington College in 2014, before her husband ran for president. Now Toensing is considered to be a top candidate for U.S. attorney for the state and could end up leading the investigation into Jane Sanders. She has pushed back against Toensing's accusations. "If they just looked into public documents, they could see that his allegations of the financial difficulty during my tenure are not true at all," Jane Sanders said.